"What's more important -- your civil liberties or your personal freedom?" These subtle moral and political questions are really tough. I can't decide between the two! Update: a clip of the appearance (with some annoying extra clicks on the soundtrack) can be found here. An article on the segement (with original Joe Quesada pencils for a mock cover featuring Stephen) is here. Read this and please consider signing this petition. I don't believe petitions ever amount to much in changing bad decisions...but it would be a nice thing to show some support for Melanie Martinez in the face of abject stupidity and cowardice on the part of her former employers. I've never seen the PBS Kids Sprout network and I've never seen this thing called The Good Night Show. For that matter, I've never seen the "Technical Virgin" parody videos that got her into trouble, if you'll pardon the unintended pun. But I know this much: when George Carlin, or Ringo Starr, or Alec Baldwin, or Sharon Stone are all perfectly acceptable to PBS but this lady suddenly isn't, on the basis of acting in one comedy project seven years ago, that means someone is arbitrarily making new standards on a personal whim. And when any person in authority has the power to suddenly invent new rules -- if there are no objective standards or even written guides as to what is acceptable and what isn't -- that's a necessary precursor to an atmosphere of complete intimidation. It is absolutely chilling in any workplace, and if that workplace happens to be Public Television -- currently desperate to avoid doing anything which might offend the religious right -- an atmosphere of terror is the next step towards outright censorship. Whoever made this call had just better hope that he or she has never, ever done anything in his or her entire life that someone, somewhere might conceivably find offensive. Oh, wait, he or she already has. I haven't been able to post or write much lately because this weather is stupidifying me. Remember the Carl Reiner/Steve Martin film The Man With Two Brains? Martin plays Dr. Michael Hfuhruhurr, a neurosurgeon who discovers he can hear the thoughts of Anne Uumellmahaye, a disembodied brain in a jar, much to the irritation of his unfeeling and money-hungry new bride Dolores. At one point, Dolores puts the brain of her disembodied rival in an oven and tries to bake it. Dr. Hfuhruhurr grabs the brain out of the oven and tries to cool it off in the sink. Anne Uumellmahaye: I… I think I'm alright. Dr. Hfuhruhurr: Count to ten! Anne Uumellmahaye: 1… 2… 3… 4… 5… 6… 7… 8… 10. Dr. Hfuhruhurr: You cooked her nines! That's pretty much how I'm feeling. I'm a very bad soldier when it comes to warm weather, as the world discovered when I collapsed from heat prostration during a family trip to Monticello when I was nine years old. (To this day, mentioning Thomas Jefferson makes me break out in a sweat.) A few years back I made a spectacularly ill-advised trip to Florida in December and it was almost more than I could handle. (This is, I must admit, not the only reason that whenever a hurricane strikes Florida I root for the hurricane to level the whole place, and long for the day when some tropical disaster eradicates it from the map. It's just one of the reasons.) A former employer of mine once offered to pay my way to attend DragonCon held in Atlanta in the summer. I asked him why he wanted to kill me. The above should demonstrate that I have a great deal of trouble focusing and being coherent this time of year, and this year in particular. I mean, look, "stupidifying" isn't even a word! That's how bad it is! 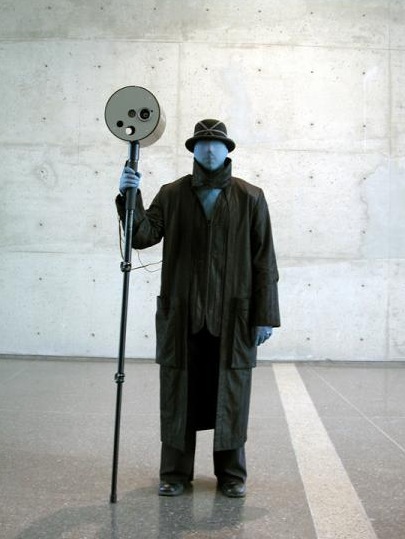 This faceless individual looks like a character out of some story by Bilal or Moebius or Ditko...but it's actually a real life concept created by an advertising agency for "nomadic media" presentations. Can you imagine walking down the street and running into this guy? I don't think the response will be as pleasant or benign as the inventors suppose. This particular fellow is described as "The Projector" -- sounds even more like a Ditko character, don't you think? -- but the company's trade is sending people out into the streets wearing backpack-mounted LCD screens. Intellectually, I realize this is nothing more than a logical high-tech extension of the standard "guy wearing a sandwich board handing out flyers to passersby"...but emotionally, it strikes me as creepy on a dozen different levels. Imagine taking a job as a mobile TV stand. Or imagine stepping outside for some air and not being able to escape walking TV sets heading toward you. The image comes from here but I found it thanks to a post here. In an interview a few years back, David Bowie remarked that "it doesn't matter who did it first; what matters is who did it second!" This aphorism could have a lot of different applications. It might refer to a purely commercial sense, meaning "The true innovator doesn't reap the commercial rewards of his or her new invention; all the wealth and fame goes to someone else who steals or borrows the innovation and puts it to use in a more accessible form." Or it might be a less cynical comment on the artistic process, suggesting that "Innovations may come about by accident or necessity; the real credit is deserved by those who recognize the innate value of the new thing on its own merits and strive to apply it to their own work. Without them it would be a fluke, not an innovation." 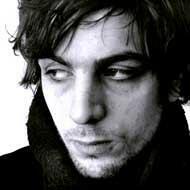 Whichever interpretation you prefer doesn't matter; what matters is that Syd Barrett was one of the ones who did it first. Other people will mention the Floyd's single "See Emily Play" as one of the seminal groundbreaking moments of late-Sixties psychedelia -- and it is everything people say it is -- or talk about how Barrett's mental decline formed the emotional core of later Pink Floyd albums like Dark Side of the Moon and especially Wish You Were Here. Barrett released two solo albums which are treasured by anyone since who's written songs with a guitar in hand...but not widely known to the general public who thinks of Pink Floyd as that band of elderly geezers who did "Comfortably Numb" or "Another Brick In The Wall." But for me, the name Syd Barrett is synonymous with the impossibly clear and powerful crashing widescreen Cinerama guitar chord that opens "Astronomy Domine" -- the first song on their debut album Piper At The Gates of Dawn. The song was recorded at Abbey Road Studios in April 1967 -- pretty much the same time the Beatles started living there full time. The pleasant British nostalgia of Sgt. Pepper is what caught the world's attention...but that power chord slide from E to Eb was a raw challenge of pure defiance that hasn't been equalled in the punk, or postpunk, or metal of subsequent years. It's a thunderclap that for a little while sounded like it might break the world open. A lot -- too much -- has been written about Barrett's mental illness and withdrawal from the public eye. Clearly, there were problems which may have been the result of an existing schizophrenic tendancy exacerbated by indulgence in psychedelic drugs. (I wonder how many cases of drug burnout might actually be situations where someone with preexisting mental issues fell into using LSD or the like as an accidental form of self-medication rather than getting the early treatment they needed?) But at the same time, anyone withdrawing from fame and attention is defying what's practically become the modern religion of fame at all costs. Witness the venom and bile spewed at Dave Chappelle for a more recent example. I've seen him condemned with the unspoken subtext of How dare he walk away from the thing we're all supposed to want? So, yeah, Syd became a bit of a nutter, lost his hair, gained weight -- though when you get right down to it, he didn't look any worse than any of the surviving members of Pink Floyd do -- but I'd like to think that on some level living quietly in Cambridge, painting and gardening, really was the right choice for him and that he was happy in these final years. He was owed that much.